Amanda – I am a musician and have an older guitar that I want t splatter paint on and hang it on the wall. 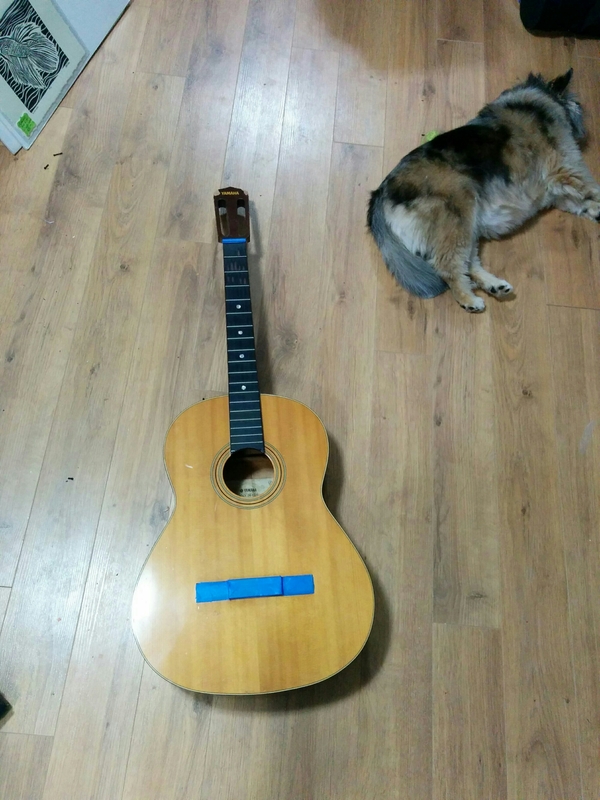 I cant afford to buy one your fantastic art pieces (musician should say it all) and wanted to get some help in prepping the guitar and also what kind of paint to get to paint on it. 1. Should i sand the guitar and if so what grit to use? 2. What kind of paint? 3. How long does it take to dry in between coats? 4. How do i choose a color palette? Hi Lee being a “starving artist” lol I can relate. What I usually do in terms of process is first strip the guitar. I usually disassemble as much of it as possible. For the acoustic one that started the series I actually ended up paper maché-ing it because the neck had broken so I wanted to give it some solid support. After I have it stripped I usually rough it up with some coarse sand paper and give it a white or black base coat with either gesso or acrylic spray paint. I usually use artist quality acrylic paint from either the Golden or Liquitex brands along with a few others I’ve accumulated. If you’re going for the pair that splattered look I would recommend the fluid or high flow version of those brands because the tube paint will require dilution where as the fluids you can use directly from the bottle. I’ve done both so it depends on your preference. To get the nice POP between colors I would recommend drying between colors to build your layers. In terms of palette like I tell all my students who are starting out choose 3 colours a 2 that are similar 1 for contrast and then add in some black and white for pop. So for example 2 blues and an orange for contrast then either black or white for interest. Once you start layering the colours will branch out into different shades etc. Once finished reassemble, varnish and add some wire for hanging. I’d love to see the finished piece.